For those of you who did not receive a Catholic Bloggers Network News Flash email yesterday, please join our mailing list. We will be sending infrequent emails updating you about Catholic Bloggers Events, Link-Ups and Features and reminding you about our Monthly Round-Up as it goes live each month. Subscribe to our Mailing List for Catholic Bloggers Network News Flash for current events, link-ups and features at Catholic Bloggers Network. 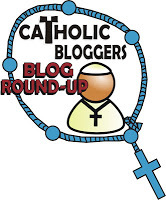 Catholic Bloggers Monthly Round-Up is up and running for April! Add your blog posts where they fit in the different categories. our newest contributors at Catholic Bloggers Network! You will receive an invitation via email. Holy Week is almost here! Special Holy Week Link-Up!